Without a doubt one of Europe's premier golf holiday destinations, guests will enjoy five-star luxury accommodation at the renowned Dona Filipa resort and the awesome challenge of San Lorenzo Golf Course on Portugal’s beautiful southern coast. A serious contender for best course in Portugal, San Lorenzo is a thrilling 18 holes of golf, as it works past lakes, pines and villas en route to the infamous Ria Formosa lagoon. 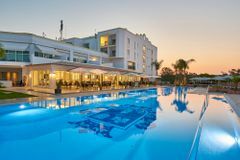 Set in the heart of the Algarve, on the stunning southern coast of Portugal, Dona Filipa Hotel is in an incredible location, only 20 minutes from Faro International Airport. Just a two-minute walk from the golden sands of Vale do Lobo Beach, the hotel itself is fabulous. Sleek and contemporary in design, the hotel offers everything you would expect of a 5-star establishment. The restaurants are a particular highlight, boasting some of the best dishes in the region. We found 6 offers matching your search. San Lorenzo has long been considered by many people to be Portugal's finest course, and is firmly established in the upper echelons of European golf. The course opened in 1988, and was designed by the American architect Joseph Lee. The fortunate creator was blessed with an unimaginably beautiful blank canvas as San Lorenzo sits in the Ria Formosa nature reserve, a vast park which is home to terrific plant and wildlife species. There are many different styles of golf at San Lorenzo, as you wind through the terrific pines, lakes, and private villas, while the course also works its way out to the coastline. There are countless spectacular holes, like the third, a par-5 towards the ocean which gets the juices flowing, before the course builds up to a magnificent crescendo with the closing stretch; the 17th is a daunting test, while the closing hole is a the classic ‘risk/reward' hole, where the intrepid golfer must strike a good approach shot to reach the spectacular semi-island green. San Lorenzo's considerable reputation is not for nothing - this terrific course will not disappoint should you visit during your next golf holiday in the Algarve. San Lorenzo is one of the finest golf courses in Portugal, and is attached to Dona Filipa. Signature Hole: There are countless spectacular holes on San Lorenzo. The third, is a par-5 towards the ocean which gets the juices flowing, before the course builds up to a magnificent crescendo with the closing stretch; the 17th is a daunting test, while the closing hole is a the classic ‘risk/reward' hole, where the intrepid golfer must strike a good approach shot to reach the spectacular semi-island green. The 5* Dona Filipa hotel is situated on the fringes of the Vale do Lobo estate, on the edge of the golden sandy beach of the Algarve coastline. Dona Filipa has long been regarded as one of the area's best 5* hotels, offering luxury accommodation for many regular visitors to the area for golf and leisure holidays. There are 154 guest rooms in total, which are stylishly decorated and appointed elegantly in a traditional Portuguese fashion. The warm earth tones are complemented by the natural light of the charming bedrooms, which are equipped with satellite television, full air-conditioning, safe deposit box and mini-bar. With the famous sand of the Algarve shoreline just yards away, this outstanding 5* hotel is a phenomenal destination for a luxury golf holiday in Portugal. The Dona Filipa hotel has 3 floodlit tennis courts and a resident instructor, a heated swimming pool, children's splash pool, sports facilities, and dedicated programmes for the kids. The area is also rich in activities - you can try a fantastic range of water sports, while the local waters are a favourite for avid deep sea fishermen. In Vilamoura, head to Casa del Forno for Italian food, or the Ostra d'Ouro Grill at the Marina for sublime seafood. The Primavera Restaurant serves a great buffet restaurant, then lovely Italian a la carte menus for lunch and dinner. The Duarte Grill is a sumptuous fine dining room, whose international cuisine is renowned for its flavour and beauty. The San Lorenzo Bar is a great golfer's watering hole, while the Atlantic Club is a refined port and cigar establishment. Second time stay at Donna Filipa and can't fault the hotel. If any complaint it would be about the cost of drinks, a G&T cost €13, needless to say I went elsewhere to get my drinks. The hotel is very nice although not quite 5 star. We stayed in the unrefurbished rooms and are a bit tired but perfectly acceptable. It's just a short walk to the bars and restaurants in Vale do Lobo which are a little quiet at the end of March. Vilamoura is much busier and a 20 euro taxi ride away. Nice room overlooking the 17th at VDL a bit tired possibly, we weren't in the newly revamped section and some of the staff felt a bit "manana" if you know what I mean. Great spot though, met some interesting folk and had a good time, will go back. Hotel excellent as usual star very helpful. Bus drivers were very accommodating. We were extremely please with the beautiful pristine hotel. The staff were very friendly and welcoming and they upgraded us to newly refurbished rooms which were excellent. We would definitely go back. Lovely hotel.Very comfortable. Superb breakfast choice. Service and staff very pleasant and helpful. Great welcome and check in. Staff are friendly, professional and extremely helpful.Premium rooms are a must - super comfortable and well equipped. Very close to beach and selection of bars and restaurants. We would stay again but only on a bed and breakfast basis - plenty of restaurants within walking or short driving distance. Food in hotel restaurants apart from breakfast was disappointing. Lovely hotel, really nice now it has been refurbished. Our room was traditionally furnished which I really liked rather than the usual rather bland modern decor. Beautiful tiles and Portuguese furniture. The breakfast was outstanding, such a good choice and constant attention from the staff. Best hotel buffet I've had for a long time. Just a shame no one south of Dover can do English bacon!! Joking aside, a lovely hotel, wonder location right on the beach, can't fault it. Great breakfast to get the stay started. Heated outdoor swimming pool. Lovely staff, always most helpful with everything. Excellent hotel, staff very efficient and freindly. A good fun hotel in a good position. Spacious double room, with large comfortable bed. Cleaned daily, with towels replaced twice each day if required. We were in some of the old rooms which are in need of some modernisation. I think it needs to be made clearer when booking about the difference in the rooms. Some of our party upgraded and were expecting the refurbished rooms and were disappointed when they had the old rooms with a slightly better view. They couldn’t be called ‘superior’. The hotel was as always very relaxing with excellent service in a great location. Elegant and stylish reception. Luxurious room and lovely view of the golf course and sea. Tea making facility was useful too. Hotel exceptionally well run. Great outdoor pool area and within easy walking distance to a very good classical Algarve beach with hotel beds on the beach too at no charge. Hotel free bus to its golf courses, so just be on your game an organist your transport 1 day in advance. Your Golf Travel organised our golf trip perfectly. Great hotel, great service, great golf course - five star rating all the way. There are few weak holes on this course and you'll love the quality of the maintenance. Believe in the yardages and just remember that they are measured in metres! (Plus 10%) The Hotel is very comfortable and still reflects the glory days of when it was built, so be kind to it! San Lorenzo is a top quality layout. A driver isn't required until the 8th, with accuracy from the tee being of greater importance. Holes 6, 7, 10, 13 and 18 are my favourites. The 10th is the best driving hole and 18 is a really good finishing hole. My Caddy Tip - "Don't miss the pin on the par 3 second to the right." The 4th hole is my favourite. Drive from a high tee position, not too far or you're in the sea. Dare you cut the corner and risk losing your ball? Don't slice your second shot or you're in the sea. My Caddy Tip - "Play away from the water with your drives on 17 and 18." All of the holes are good. Aim for right side of fairway on most holes. Play early as you get an easy run. The hotel is excellent - good room service, mattresses and pillows which lots of hotels do not have. Bus runs to golf course every 40 minutes. My Caddy Tip - "If you are not a single figure handicapper play of the yellow tees or shorter." My Caddy Tip - "Driver in the bag only." All 18 were excellent holes. Hotel very nice! My Caddy Tip - "Avoid the water." All the holes around the water were fantastic. Bring your A game. The hotel was finishing its refurbishment but still quality. My Caddy Tip - "Course management is important." The Hotel was first class. Great staff. San Lorenzo was great. Varied course, some hills-drops, generous fairways. Val de Lobo is a must play. Royal had a fantastic 16th over the beach-ravine par 3. Off season local shops not open. Need a car or taxi for decent restaurants. Hotel renovation offer for foods at SL Club was great. My Caddy Tip - "On SL hit right to get the run needed. Greens were slow but true. Hang back on 5th or run off onto the beach mud!" Best holes were round the beach. 6 & 7 and 16 & 17 were great with plenty of wildlife to see. My Caddy Tip - "Get your lines right on 6 & 7 - card wreckers." Altos and any in Val Do Lobo area is my type of golf. My Caddy Tip - "Just enjoy the experience." Hotel has been recently upgraded (did need it). San Lorenzo is a great course all year round with dramatic closing holes. My Caddy Tip - "Don't go in the water." Hotel was very nice, good course to play 2 or 3 times during a visit. My Caddy Tip - "Just play normally, with a little care." Course as always is a joy, would be my choice for a last ever round. Hotel good but bedrooms a little tired, but will not stop us returning. My Caddy Tip - "Take an extra club on 2." San Lorenzo and Pinheiros Altos are superb courses and well worth playing. Best holes were 6th, 7th and 18th on San Lorenzo. My Caddy Tip - "Excellent greens and well protected by bunkers." Good course and great hotel with lots of very good restaurants nearby, do not need a car. My Caddy Tip - "Play 18 as a par 5." The 6th was fantastic with a drive over the corner. My Caddy Tip - "Avoid all water." The hotel was double booked. My Caddy Tip - "Enjoy the golf." 17 was an excellent hole. Now that I can play San Lorenzo and Pinheiros Altos in the package it is more interesting. I can then add a twilight in Val de Lobo and have three courses in the seven days. The hotel is always welcoming. The staff are not changing often so they remember the guests and greet you as old friends. My Caddy Tip - "Take plenty of balls!" The course is the star here - I think the hotel rooms could do with an upgrade. But I would rather that way round. My Caddy Tip - "Plot your way round - there are several very tough holes." Favourites were 5, 6, 7, 8. Hotels good but needed a do up. My Caddy Tip - "Don't buy balls off the course prowlers." San Lorenzo is my favourite course of all. Unfortunately I was not paired with anyone on two of the occasions during the week which was disappointing. Beautiful course and weather - a true test. All holes need thought and careful strategy to play them well - great experience. My Caddy Tip - "Consider course management and your ability." Hotel is good but not really 5 stars. My Caddy Tip - "Play to your handicap and don't be too optimistic." Keep it straight on 18th. My Caddy Tip - "Don't use a driver." We really enjoyed all of the Pestana courses. The villa we had was lovely and we were made welcome at all the venues. Perfect for a Portuguese golf holiday. I thought the Montgomery course was superb, especially when they were playing the Turkish open on it. 1st is a dog-leg left, play for the middle of the fairway. The hotel was/is first class. My Caddy Tip - "Greens are tricky." Played this golf course many times and its always a pleasure and a challenge. A stunning picturesque course with many challenging holes, especially the par 5 8th, the par 4 18th, and the par 4 6th. All need thoughtful club selection and positioning of shots. My Caddy Tip - "Beware of the 8th, after a good drive care needs to be taken on the next shot." All the holes were brilliant. Hotel very good. My Caddy Tip - "Keep as straight as you are able to as it is easy to find the water." 18th hole was fantastic. Take plenty of golf balls. My Caddy Tip - "Don't under club on your approach shots into the greens." A course I never tire of playing. Second nine is more difficult to score on. Sixth to nine great holes. Always in great condition. My Caddy Tip - "Play the 6th as a par five." We find all the holes very challenging. However, we all love San Lorenzo and the Dona Filipa Hotel and although we are all in our seventies we hope to make a trip next autumn. My Caddy Tip - "Don't be too ambitious and play to your ability." San Lorenzo was in good condition, with fast greens and playing relatively easy as long as my drives were straight! The Dona Filipa was fine but we did not have one of the refurbished rooms which was disappointing. The staff were very attentive but it was a long walk from the bedroom to the breakfast restaurant and swimming pool. My Caddy Tip - "Lay up on 18 in two and enjoy the wedge to the green over the water." Loved the holes close to the water. Hotel adequate when we visited. The rooms were a good size but generally rather tired. We were however, told that a renovation programme was being started. My Caddy Tip - "Keep your head down!" A beautiful and well kept course, definitely the best in the Algarve. Quaint clubhouse, and the hotel was nice and clean but in my opinion is starting to look a bit dated. All the staff were really helpful and friendly. My Caddy Tip - "Just keep the ball in play off the Tee! You don't need to use a driver on a lot of the holes." 18th was my favourite hole. I think holes four, five and ten where fair tests. My Caddy Tip - "Don't use a driver on hole five." You have to be a confident golfer to play San Lorenzo near your handicap allowance, holes near the sea can be demanding due to wind strength and accuracy will be rewarded more than distance. Enjoy it, it's quite unique! All the holes boarding the nature reserve were fantastic. My Caddy Tip - "Generally hit more right than left." The Hotel was good and the 18th on Vale de Lobo was good. Great stay but a bit noisy when the nightclub comes out in early hours. Golf break was good value for money - took friends who stayed and played for the first time and look forward to returning. Hotel dated but still ok. Ideally placed for playing San Lorenzo or the Vale de Lobo courses and right next to Montys for a great night out. San Lorenzo is a fantastic course offering a great challenge for golfers of all abilities. Several holes require length off the tee, however some of the longer holes have narrow fairway targets or doglegs which means it's not necessarily a driver off the tee at the par 5's. Water comes into play on a number of holes and 18 in particular has you driving down the left of a small lake to leave yourself a wedge across more water to the green. Well worth a visit for the hole alone. My Caddy Tip - "Accuracy off the tee is a better strategy than distance." Beautifully located hotel near an excellent beach, top class golf course, and good restaurants close by equals a great holiday. My Caddy Tip - "If you go for the green on the 18th hit left." San Lorenzo is a great course but one that is now getting dated and because it is played predominantly as a "resort course" there are a lot of people playing the course who are not golfers so it is slow to get around. Great course, especially the stretch by the water. Hit it straight and you'll score well. Great greens. Hotel was great, restaurant superb, especially breakfasts. My Caddy Tip - "Be accurate off tee and you can score well." Hotel great with fabulous breakfast, just enjoy a great course. My Caddy Tip - "Have a good warm up so that you enjoy this great course." San Lorenzo was a fair test and a great layout. The most challenging hole is the 8th par 5. The most interesting holes are around the lake, because of the views. My Caddy Tip - "Keep it on the short stuff!" Super course. On the 3rd round, I birdied 4 holes in a row, something which I have never done before... Alas I still paid the money out. My Caddy Tip - "Enjoy the course." The holes by the estuary are great, you need to play the course a couple of times to get the feel for it. Fabulous golf course, the best in my opinion in the Algarve. The hotel is fine, I believe they are upgrading, so should be even better. My Caddy Tip - "Be careful where you drive - there is water in some interesting places!" The hotel was very good and the 6th and 7th holes were just beautiful. My Caddy Tip - "Take a sky caddie with you." Hotel was being refurbished whilst we were there. Going back again. My Caddy Tip - "Greens are great." One of the best venues in the Algarve. Excellent venue for golf and accommodation. Hotel looks after clubs and arranges for transfer to buggies before your game. Excellent breakfast with a fantastic chefs omelette. A number of excellent holes with water in play. My Caddy Tip - "Keep the ball on the fairway." Great course, plan to go back next year. Hotel ok, village area outside hotel excellent. My Caddy Tip - "Don't always hit your longest club." 6, 7, 8, 17 & 18 are all great holes with water - commit to the shot and take plenty of club. I was short on my approach shots quite a lot. The hotel is great and even better now it has been refurbished. Staff very friendly. My Caddy Tip - "Take plenty club as greens are receptive." 18 was my favourite hole. All holes are good, especially number 6. May limit the golf at San Lorenzo and maybe drive to Penina. Pinheiros Altos was disappointing. Out of all the holes at San Lorenzo, the 6th & 7th would be my favorite holes. My Caddy Tip - "Play for the middle of the greens and club up." Great hotel, good location. Superb golf at San Lorenzo and Quinta. My Caddy Tip - "Don't try to over power the courses, think your way round." 5th - 8th, 17th & 18th are fantastic holes. Great for families/golfers/couples. Have been over 20 times and never disappointed. 5, 6, 7, 8, 6, 17, 18 all great holes. Work on you're chipping: the Bermuda grass is tricky compared to UK. My Caddy Tip - "Choose the right tees for your handicap, take a buggy, enjoy some great views. Buy water at supermarket for 25 cents a big bottle as opposed to €2.50 per small bottle!" The holes along the beach side are fabulous. Not too penal off the tee but plenty of challenge. Great course! Favorite hole is the 18th. Take plenty of balls and enjoy yourselves. Insect repellent would be good. My Caddy Tip - "Don't try and drive water on the 18th." First few holes are good openers to settle you down, from the 6th on you know you are playing in a special place. My Caddy Tip - "Don't expect to par every hole." Hotel was fabulous, had a free a la carte dinner on our last night our golf was average but we can't blame the courses for that. There are few courses in the world which offer so many holes with outstanding views as well as quality fairways and greens. Each hole has different challenges with water coming into play on many. The 18th is as tough a finishing hole as you will find. The hotel is newly refurbished with good food. The adjacent private beach is pristine and the location is ideal. My Caddy Tip - "Keep clear of the water." Hole 6, par 4 dog leg left off a high elevation tee has great views over the estuary / bird sanctuary. The 18th is a great hole! My Caddy Tip - "Use your handicap and don't go for shots where the odds are against you." My wife and I had a nice break at Doña Filipa for our Silver Wedding Anniversary. Hotel was lovely, although not quite as plush as we expected. The shuttle between the hotel and golf course was a bit hit and miss. Some people ended up getting taxis to the course as bus filled up very quickly. Would definitely go there again. Definitely worth playing it twice as you learn do much from the first round. I was 6 shots better on day 2 even after beer. My Caddy Tip - "Keep your driver in the bag for most holes, you don't need it." Would go back, the course is fantastic. A very nice drive down to the beach. The Hotel is fine and they looked after us very well. My favorite hole is the 17th. My Caddy Tip - "Enjoy it." Really good hotel and challenging course for a high handicapper but very enjoyable. My Caddy Tip - "Be accurate rather than long!" The 18th at San Lorenzo - "Go For It "
I have been staying at Dona Filipa and playing San Lorenzo since the early years when golf was free if you stayed at the hotel. Sadly those days are long gone but I am regularly drawn back to the area. The course is always in great condition and although not the longest by modern standards the difficulty more than makes up for it. Some very challenging holes and outstanding scenery make this a venue not to miss. My Caddy Tip - "Plan to play when the tide is out! You can still play your recovery shot off the beach!" The course is outstanding and varied. The rooms in the hotel are tired and in need of upgrading. Would happily go back but maybe stay elsewhere. My Caddy Tip - "Just enjoy the fabulous scenery." Second visit to San Lorenzo maybe because it was early in the season there was still quite a bit of work going on. However, the greens were very good and the setting is just magnificent. My issue is regarding the cost of buggy hire which was €50 per round. This is bordering on scandalous. San Lorenzo is a fabulous course layout with challenging holes around the beach and alongside/over the numerous lakes. The greens were great however a few fairways didn't look their best but were very playable. Reasonably quiet when we played in early March. Some of the fairways and greens looking a bit tired. As in saying Penina was average, off the yellows this wasn't really hard except for holes 6,7,8 and 18. You are presented in the main with wide fairways and true greens, the staff there were good fun too. Good layout but in need of care and attention. Greens ok but fairways poor. Practice facilities very poor. Past it’s best unless there is some investment. Really enjoyable. Greens very good for this time of year. Course has very interesting layout and not boring.Last two holes were very tough.Real card wreckers. Overall is a very quality course. Clubhouse not as luxurious as some others others in the Algarve.Did not be a match with the course quality.But was adequate. A great course. not as manicured as Quinta and Laranjal but a good test with some delightful holes by the nature reserve. Clubhouse is tired and needs updating. Practice facilities are limited and not particularly good. It’s a hard course and the greens are very tricky. There is a lot of risk but not much reward unless you are a low handicapper. Would not recommend for anyone like us with handicaps of 22 and 23. The condition of the course was ok though (December 2019). We wouldn’t play again - there are plenty of other courses nearby offering a better experience and value for money. Always a delight to play San Lorenzo. Some very challenging holes and then a few with wide fairways and easier green approaches. The signature hole on 18th is a nightmare, but enormous fun - a double dog-leg! I always enjoy the holes down by the River Formosa, very tricky with the greens out into the water, but so great to play. Still one of my favourite courses. We had a late lunch afterwards in the clubhouse, the food was excellent and service very good. Nice staff, nothing is too much trouble. Best golf layout in the Algarve. Some stunning holes overlooking the Ria Formosa nature reserve and the Atlantic. Always a pleasure to play. Superb course, one of our favourites. A good course which i would play again .We had some poor weather at the end of the round which made the last 4 holes not so enjoyable. Teed off late morning, and there was a lot of slow traffic ahead of us. Gave us time to admire the views and guess how much each of the villas around the course would cost! A number of great holes - greens and tee boxes not in the best condition - would play it again and hope to get round in less than 5 hours! Lovely golf course. Felt the tees were a little poor but this was maybe due to heavy volume of players but overall the course was in good condition. We did have one particularly slow round which was over 5 hours. Enjoyable rounds. Well maintained course and greens were reasonable. Allowed to play on our own (instead of having to pair up with strangers). Buggies were basic considering they cost 50€! Changing rooms very small but well equipped. Staff were friendly, courteous and helpful. Great all round golf course. Difficulty average from yellow tees, white tees longer and thus much more testing. Take your choice. Course in excellent condition. The course was in good condition although the round was slow you would expect that on a resort course about 5 hours. Buggies very expensive to hire. Q - How much does a buggy cost to hire? Q - How much does it cost to hire a trolley?